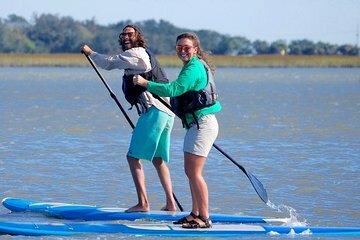 Exploring Charleston’s tidal marshes by stand up paddle board increases your chances of seeing wildlife hiding among the reeds while providing a fun and challenging activity. First-time paddle boarders love the personalized instruction and attention from your guide, while just about everyone appreciates getting close to dolphins, turtles, and more in the wild. Bring water, sunscreen, sunglasses, a hat, and shoes that can get wet. Please arrive 15 minutes before your scheduled departure time. The minimum age requirement for a paddleboard tour is 13 years old.